Furuya et al. (2012) was accepted in Curr Genet. Furuya et al. (2012) was published online in Yeast. Furuya and Niki(2011) was published online in Yeast. Aoki et al (2011) was published online in Genes Cells. Aoki et al (2011) was accepted in Genes Cells. Contact us page were newly created. Aoki et al (2010) was accepted in Yeast. Furuya and Niki (2010) was published in MCB. We updated a transformation protocol in research tips. We added a transformation protocol to research tips. We started the resource distribution. 10 strains and 5 plasmids are now available. Furuya and Niki (2009) was published in yeast. 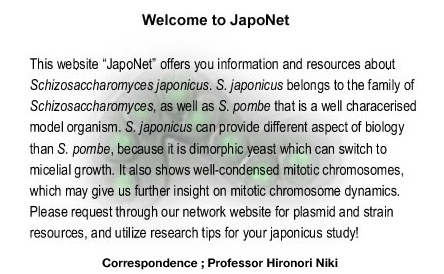 We opened S. jpaonicus network website "JapoNet". Please enjoy our website! This website is for researchers who is going to study relatively new fission yeast, S. japonicus, study. ・A review on S. japonicus is now available, and it's free via online open. Kanji Furuya and Hironori Niki (2016). Keita Aoki and Hironori Niki (2016). Strain and Plasmid resources are available! !